Just as it took some time for the Jewish believers to scatter for the sake of spreading the Gospel message, it appears that Peter, the early church’s leader needed to be reminded of Jesus’ words. He needed to be “scattered” regarding his worldview. In Acts 9:32 and onward, Luke focuses his account on Peter’s ministry where he raises Tabitha from the dead, thus fulfilling Jesus’ words of the greater works his disciples would perform. But as we move into chapter 10 we see the extent to which the Holy Spirit goes in order to reach a non-Jew. 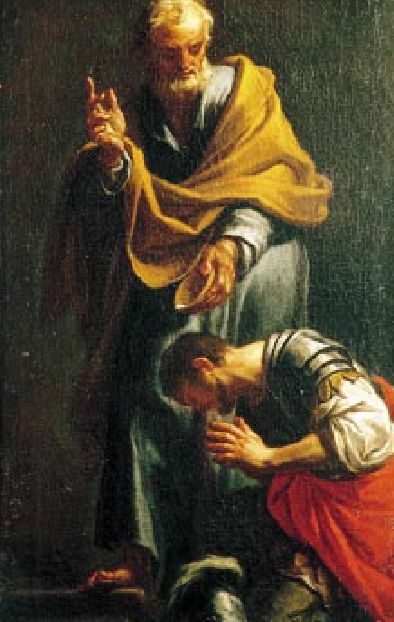 Cornelius a Caesarean centurion from the Italian cohort is a God fearing man who continually gave alms to the Jewish people and prayed. An angel of the Lord was sent to him not to preach the Gospel but to get him to Peter who would. The details needed to get a hold of Peter were specific; his name, his location, and so forth (Vv.1-8). Concerning Peter, he too needed a vision from God in order to prepare him to meet Cornelius. Jewish customs, some of which Jesus eradicated (E.g., all foods are now clean) would have kept the Gospel from going forth to this God fearer but the Lord’s mercy vanquished this exclusion. Why Peter was still stuck with dietary restrictions after Jesus declared all foods to be clean is puzzling to me. Perhaps he forgot or letting go of certain things for him was difficult. Regardless, this obstacle had to first be removed for the Gospel to go forth. The chapter ensues with Peter proclaiming the Gospel to Cornelius and his household. As is the pattern in Acts, the historicity of Jesus the Nazarene, his life, works, death and resurrection are the centerpiece of Gospel preaching and so is the fact that the apostles were eyewitnesses of these events (Vv.34-38). Real conversions occurred only after divine intervention followed for both Jew and Gentile alike. It’s as if this account is bringing to the reader’s attention the need to remove any obstacle/stronghold (I.e., false ideas) from the hearer before Gospel life can be experienced. May God have mercy on the church and those she longs to reach with His life giving truth, and may God’s people labor to understand those outside the fold so that we are not a hindrance to those coming into the kingdom.